You are reading an entry from the Ironic Sans archive. This entry was posted on June 18, 2007 and is filed under Business, Language, Lists, Politics. The Economist is a weekly magazine that focuses on world news, business, and politics. The magazine, based in London, is dense with information and can be tough to wade through. The publishers target an upper-class demographic, and it shows in their ads for the magazine. A recent ad had a tag line which read, “It’s lonely at the top, but at least there’s something to read.” The Economist is the sort of magazine pretentious people like to be seen reading. Naturally, I have a subscription. Article topic: What conservatives get, and do not get, about foreign aid. Article topic: Former CIA Director George Tenet’s new book has some factual errors but is still worth reading. Article topic:Two big meat producers agree to merge. Photograph: A polar bear stands on a piece of ice surrounded by water. The article is about global warming. Article topic: Scrubbing carbon from coal-fired power stations is possible but pricey. Article topic: Businesses are engaging in war game style simulations to gain new perspective on complex problems. Headline: Shall we play a game? Article topic: The cost of making cell phone calls overseas. Article topic: Californians are leaving the state, filling its neighbor states with former Californians. Article topic: Rio de Janeiro’s economy isn’t doing so well. Haha some of those are pretty great. I particularly like “Tsarstruck.” I’ve been kinda thinking of getting a subscription to the Economist, but I’m pretty sure it’d just pile up and not get read. the only time I can wade through the magazine is while I’m traveling. Reading The Economist is a decent way to spend those five hour flights from DC to CA. I’ve tried reading it while grounded but, yeah, it doesn’t really happen then. I used to have a subscription to the Economist, but once I stopped my two hour (each way) commute it was too hard to get through it. Now, like Patricia, I usually read it only when I’m flying. Gah. Seriously, emissionary positions? That just sounds gross. Definitely a headline too clever for its own good, though. Alright, now I’m a huge fan of puns and have a desolate social life to prove it. But still, some of those should’ve been nuked at the first round of proofing. … but still, WHEN IN ROAM is a winner. “It’s getting unbearable” … just too easy. 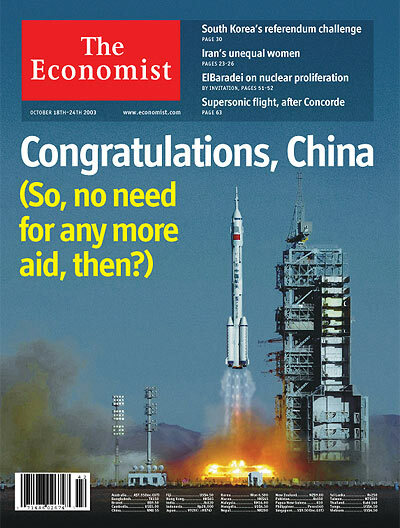 One of my fave covers from the Economist was when China launched a manned spacecraft. They have a great sense of humor, and really aren’t afraid to call it the way they see it. I subscribe to The Economist, but I think it has a different significance in Britain and the Commonwealth where reading the magazine signifies a political and economic conservatism, and being a fuddy-duddy rather than being pretentious. Perhaps that is also connected to the fact that the word ‘liberal’ in the non-American English speaking world tends to be more like what you call libetarian-lraning conservatism in the U.S.
Actually that kind of headline style is common in the UK media — for extreme examples see the alternative press e.g. Schnews or Private Eye. The Australian media turned the headline pun into an artform — see e.g. Defamer Australia for examples. It’s true that yank journalists can really research a case when they want to… but I think it’s much rarer for them to go out on a limb… and the style reflects that (including the headline style)…. much more plod, much less flair. The Economist is great. I think they offer a podcast of the entire newspaper now, too. It is funny you posted your comment on that subject september 11th. A coincidence ? I am a total fan of ‘The Economist’ - and esp. with the new ‘podcasts’ made available, its even better! For a magazine to come up with so much of editorial content and almost, most appropriate ‘headlines’… all the time.. … isn’t that easy! sometimes, the captions are full of that too. for example, in the recent special report on china, there’s a caption “A sight to terrify the enemy” under a picture of the chinese army marching. All of the soldiers are women wearing miniskirts. I have read a few good stuff here. Certainly worth bookmarking for revisiting. I surprise how so much attempt you put to create one of these great informative web site.